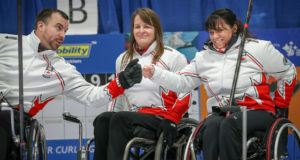 Canada defeated Korea 10-4 in Day 5 action to secure a spot in the playoffs of the wheelchair curling event at the 2014 Paralympic games in Sochi, Russia. 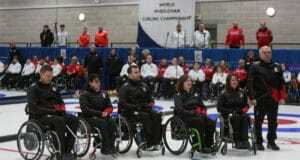 The last time Canada met Korea in Paralympic wheelchair curling action was in 2010 at the gold medal game in Vancouver. So, in a way, today’s game was a rematch of the two powerhouses from four years ago. The obvious difference this time is the makeup of the Korean team. 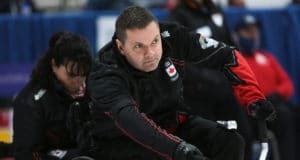 While Canada’s team is made up of three 2010 veterans and two newcomers, the Korean team has only one member, Myungjin Kim, from their silver medal squad. They headed in today’s match with a middle-of-the-pack record of two wins and four losses. According to Canadian skip, Jim Armstrong, playing Korea always keeps Canada on their toes. 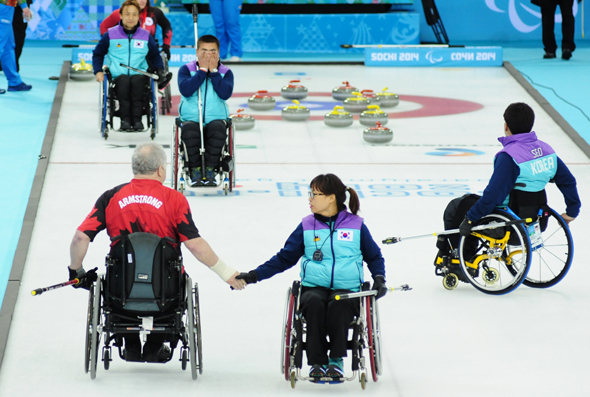 Canadian skip Jim Armstrong shakes hands with Korean lead, Mi-Suk Kang, after defeating Korea 10-4 at the 2014 Paralympic Winter Games in Sochi, Russia. Canada trailed 1-0 after the first end before Armstrong executed a hit for three in the second. The Canadians widened their lead to 5-1 thanks to a two-point steal in the third. Korean skip Jong-Pan pulled it back to 6-4 with a draw for two in the sixth, but his draw attempt in the next end came up short and left Canada with a four-point end. The Koreans extended the handshake and the game was over in the seventh end with Canada coming out on top 10-4. Canada and Russia remain at the top of the round-robin standings with six wins and one loss. Tomorrow Canada plays Slovakia (4-3) at 9:30 a.m. and Finland (1-6 ) at 15:30 (local time) in the Ice Cube. 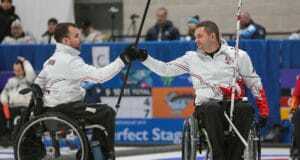 For full information about Team Canada at the Sochi 2014 Paralympic Games, please visit paralympic.ca/team-canada. Next: Ford World Women’s Curling Championship begins Saturday in Saint John, N.B.